Table Tennis is like many other sports, in that its fans can rarely agree on just who was the greatest player of all time. While every fan will have their personal favourite, others will repudiate their argument with glee. 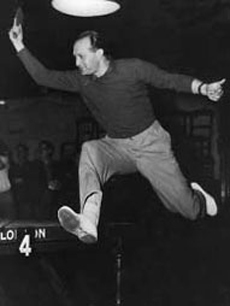 Any list of the greatest table tennis players of all time cannot help therefore but be a personal and subjective view. However there are some players who would make it onto anyone's list of the all-time greats. It would be necessary to head back into history, before World War Two. The great Hungarian player Viktor Barna - http://en.wikipedia.org/wiki/Viktor_Barna may not be featured too often on www.bodog88.com - http://www.bodog88.com/, but his name is never forgotten by true fans of the sport. Certainly, if he was playing today, he would be making money for punters laying down bets on bodog sports betting. This incredible player won gold medals at the World Championships no less than 21 times while competing for Hungary, and once while competing for his adopted country of England. He also won a heap of bronze and silvers, his medals being in the singles, doubles and team competitions. He even found the time to fight in World War 2 in the British Parachute Regiment. Heading further forward in time, Zhang Jike surely counts as one of the greatest contemporary players. Jike recently claimed the 2013 World Table Tennis Championships Men's Singles Title - http://www.mhtabletennis.com/2013/05/zhang-jike-defends-world-title.html, winning again the crown he last won in 2011. There had been some concern that the player's skills were fading over the beginning of 2013, as he lost to a string of foreign contenders. But his performance against Wang Hao in the 2013 final showed he had really returned to his best form. On his best day, Jike's sheer speed is impossible to live with, and he could yet become the first player to win a grand slam of titles twice. Any lovers of online sports gambling would be well advised to head to a site like bodog sports and place a bet on him doing so. It would certainly be foolish to bet against him in his current form. It would be wrong for anyone writing about table tennis to omit a female player from any list of all-time greats. As the recent women's final at the World Table Tennis Championships - http://www.mhtabletennis.com/2013/05/li-xiaoxia-completes-grand-slam-with.html showed, women are some of the real stars of the game, with Li Xiaoxia beating Liu Shiwen in a superb match and becoming the 4th female player to claim a Grand Slam. Perhaps the greatest female player of all time though was Deng Yaping, who's peak came in the 1990s. The diminutive star, who was only 1.5 metres tall, won her first Chinese National Championships at the age of 13. She won singles and doubles gold medals at the Olympics in 1992 and 1996, and when she retired, at the age of just 24, she had captured more titles than any player in table tennis. Her final tally included 18 world titles, as well as her four Olympic golds. A bodog sportsbook in her day would surely have had to feature this amazing player. Many people who enjoy table tennis and free gambling games online will know all about the final player on the list, the great Swede, Jan-Ove Waldner. Sometimes referred to as 'The Mozart of Table Tennis', this silky Scandinavian was known as 'Evergreen' by his legions of Chinese fans. The name 'Evergreen' is appropriate too, as this star is still playing at a high level at the age of 47 currently in the Swedish A league. He is now playing against players who were coached by stars he played against in the earlier decades of his career. At one point he was better known in China than US President Bill Clinton. Waldner is also one of only five players to have competed at all of the Olympic Games - http://olympic.org/ since table tennis was introduced for the first time in Seoul in 1988. He is also one of only four male players to have completed a career Grand Slam of titles, a feat he managed in 1992 after winning the Barcelona Games. For his longevity, as well as his considerable achievements, the Swede is a worthy inclusion on every list of the games' greats, if not at the top.